A new view on the essence of chemical elements and their systematization is given. A version of the periodic table in that the basic role is assigned to hydrogen. Practical possibilities of using the proposed table in the field of metallurgy and material science are discussed in detail. Key words: hydrogen, nitrogen, oxygen, elements, periodic table. Bazyleva O.A., Bondarenko Y.A., Timofeyeva O.B., Khvatsky K.K. Influence of Crystallographic Orientation on the Structure and Properties of BKHA-1B Alloy Investigation into single-crystal (SC) billets of intermetallide BKHA-1B alloy samples with different crystallographic orientation (CGO) revealed influence of CGO <001>, <011> and <111> on the microstructure, modulusof elasticity, ultimate shorttime strength and yield point, long-term strength and thermal fatigue. Application of BKHA-1Btype materials will make it possible to reduce: part mass by 10…15%, labor intensity of their production, cost of charge billets, as compared to heat-resistant alloys, by 25…30%; to increase the working temperature by 50…100°C, increase service life of nozzle blades about 3-fold, and that of discs 1.5- to 2-fold. Key words: single-crystal billets, microstructure, modulusof elasticity, ultimate short-time strength, yield point, long-term strength, thermal fatigue. Gushchin N.S., Takhirov A.A. Hardenability of Wear-Resistant Castings with a Thickness of 50 mm The conducted investigations made it possible to establish conditions of achieving full hardenability of nodular chromium-nickel iron. Dependence of carbide phase amount, nodular graphite and structural composition of the metal base of the alloy under investigation on its silicon and chromium content and casting's section depth is shown. Key words: hardenability, chromium-nickel iron, nodular graphite, carbides, austenite, martensite, troostite, chemical composition, casting's section. Investigations have been conducted to establish the mechanism of phosphorus recovery when making iron in a coke fired cupola. Sources of phosphorus when making iron are all charge components. Phosphorus recovery into iron is possible under participation of iron's carbon, which may lead to a decrease in its content. Key words: phosphorus recovery, cupola, charge, chemical composition of iron. The article discusses matters of preparing aluminium master alloys with titanium, boron and phosphorus, and also experimental data on the inoculation of hypereutectic silumins with those master alloys are presented. Key words: aluminium, silicon, phosphorus, hypereutectic alloy, crystal, titanium, boron, strontium. Shown are the technical-and-economic expediency of manufacturing products from hollow ingots, and the fallibility of some techniques of their manufacture adopted in the domestic and foreign practice. Presented is a modern process of manufacturing a large-size hollow ingot with a mass of 69.9 t, developed using a new method of designing casting process and geometrical parameters for both the body of the hollow ingot and its sinkhead, ensuring the conditions for directional solidification and obtainingsolid and homogeneous metal structure without axial defects of shrinkage origin. Key words: hollow ingot, sinkhead, directional solidification, feeding, shrinkage defects, pouring. The technology of thin tapes reception of highstrength nikelid of the titan with nanocrystal structure with the size of grain 5…15 nanometers the method proskating rinks of the strip in the rolling mill is presented. Experimental data are received and drawn theoretical conclusions on interrelation of evolution of defective structure with character of change of mechanical properties nikelid of the titan at influence of intensive plastic deformations. Keywords: nikelid of the titan, high-strength, plastic deformations. Tlibekov A.Kh. Design of production the parts from sheet. 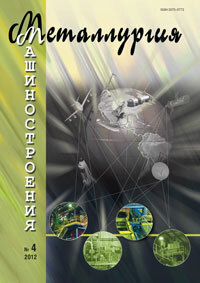 Technology and the efficiency Descry methods of modernization of production the parts from sheet. Affirms, that the modernization, based on the complex analysis of the existing production is more effective in comparison with a non-systemic or "dot" modernization. Summarizes the stages of the upgrade project, the recommendations on choosing the equipment and the project of the sheet processing shop. Key words: the modernization of production, Process technology, Laser cutting of plate, Stamping on the punch presses, Bending on the press brake.